IT Revolution Research supports both qualitative and quantitative research projects with various partners, including DevOps Research and Assessment (DORA), Puppet, and others. Our goal is to discover the characteristics—and quantify the impact—of high-performing technology organizations. 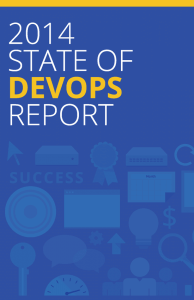 Through the DevOps Enterprise Forum and the State of DevOps Report, we gather real-life stories of transformation and statistical evidence to support DevOps methods. For research inquiries, please contact us. 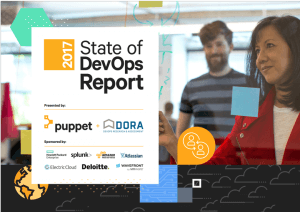 For the past five years, we have participated in the State of DevOps Survey and the ensuing State of DevOps Report, with partners Puppet and DevOps Research and Assessment (DORA), gathering data on over 20,000 respondents to better understand the health and habits of organizations using DevOps principles and patterns. Below you can read about some key takeaways from each year's report. You'll also find links to further reading. 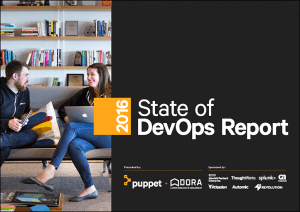 The fifth annual State of DevOps Survey addresses some of the most pressing issues for the DevOps community today. These include concerns about understanding the ROI of DevOps; the role of experimentation and its value; how to integrate security into DevOps; and the relationship between employee engagement and organizational success. High-performing organizations are decisively outperforming their lower-performing peers in terms of throughput. Improving quality is everyone’s job. Taking an experimental approach to product development can improve your IT and organizational performance. Undertaking a technology transformation initiative can produce sizeable cost savings for any organization. High-performing IT organizations deploy 30x more frequently with 200x shorter lead times; they have 60x fewer failures and recover 168x faster. Lean management and continuous delivery practices create the conditions for delivering value faster and sustainably. High performance is achievable whether your apps are greenfield, brownfield, or legacy. IT managers play a critical role in any DevOps transformation. Deployment pain can tell you a lot about your IT performance. Burnout can be prevented, and DevOps can help. The third annual State of DevOps Survey introduced more questions so we could gain a better understanding of the impact IT performance and DevOps practices have on overall organizational performance, using metrics that matter to the business: profitability, market share, and productivity. Respondents from organizations that implemented DevOps reported improved software deployment quality and more frequent software releases. Our findings substantiate the business value of DevOps too: it enables high performance by increasing agility and reliability. Complete those deployments 8,000x faster than their peers. Have 50% fewer failures and restore service 12x faster than their peers. Respondents of both the 2011 and 2012 survey are likely to be early adopters, making the increase in DevOps adoption rate much more telling of the overall growth of DevOps during this time period. Not surprisingly, organizations that have implemented DevOps practices are up to five times more likely to be high performing than those that have not. In fact, the longer organizations have been using DevOps practices, the better their performance: the best are getting better. For three days at this private event, we gather 60 of the best thinkers and doers in the DevOps space to tackle the community’s toughest challenges. How do we determine these challenges? At the conclusion of our DevOps Enterprise Summits, we ask all attendees and speakers to answer a simple question: “As you return home from DevOps Enterprise, what is still your biggest challenge going forward?” We compile the responses and ask our gathering of thought leaders to collaborate and generate a piece of guidance with their best solutions to the challenges. The guidance is provided free to the community. See all the free white papers on our Forum Papers page. 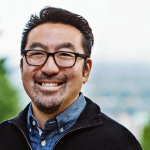 The DevOps Enterprise Forum’s mission is to bring together technology leaders and facilitate a dialogue that solves problems and overcomes obstacles in the DevOps movement. Our goal is to create guidance on the best-known methods for overcoming these obstacles and to share that guidance with the technology community at large.